My little "r" has decided she loves carrots recently. I don't think I've ever seen someone who can down carrots quite like she can. So I've been serving them as a side dish more these days. I decided to try something new the other night and it turned out pretty good. Even little "r" approved. 1. Lay the carrots on a large sheet of tin foil, sprayed with cooking spray. 2. 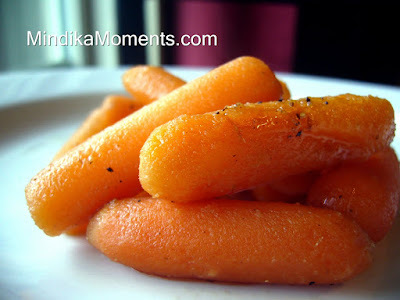 Season the carrots with salt & pepper. 3. Lay the butter on top of the carrots then sprinkle with the minced ginger and brown sugar. 4. Wrap the tin foil around the carrots and seal tightly. Not a huge fan of cooked carrots, but I LOVE ginger. I will have to try this and maybe I can become like "Little R" and my girls who will eat anything! Did you know that your cupcakes are the 4th sought-after recipe on Studio 5 website? You're famous and rightfully so! Yum, yum, yummy. . .